Are you ready for the NEXT LEVEL of Adventure? For the third annual KTM Australia Adventure Rallye, we are going far beyond anything we have done before. Orange adventure riders will traverse unexplored terrain in the stunning Northern Territory for the 2018 KTM Australia Adventure Rallye: Outback Run, June 1st – 8th 2018! Open to Orange Adventure Riders with the following eligible KTM bikes: 640, 690, 950, 990, 1050, 1090, 1090R, 1190, 1190R, 1290 & 1290R models. The Rallye is tailored to suit all rider abilities, from first year Adventure riders up to seasoned Adventure pros. For 2018, the Rallye will take place in parts of Australia that you may have only dreamed of exploring – let alone experiencing with other like-minded orange adventurers on the back of your KTM adventure motorcycle. And we wouldn’t want to take riders to this outstanding area without making the most of it: meaning the Rallye will take place over seven epic days. This rare and unique opportunity has been made possible for KTM riders through a partnership with North Star Pastoral, with the Rallye kicking off at the amazing Maryfield Station, 500km south of Darwin. And what would a fitting finale be to this epic Rallye? How about rolling into Alice Springs for the start of the 2018 TATTS FINKE Desert Race! The KTM Australia Adventure Rallye is about offering a great experience to our ORANGE adventure riders – and what better way to do that than with an epic 7-days exploring the best that the Northern Territory has to offer on your KTM adventure bike. Bring old friends or make new ones, in the spirit of adventure riding, the Rallye is about getting back to the basics. 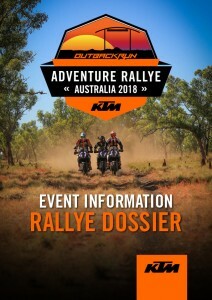 What is the KTM Australia Adventure Rallye all about?